I purposefully didn’t plan much for this weekend; I had a quiet day yesterday, with a bit of shopping and a Spanish-subtitled horror movie, and I planned to spend part of the day working. My coworker was eager to get out and see a bit more of the city, so we ended up spending the day exploring– and it was quite a day! 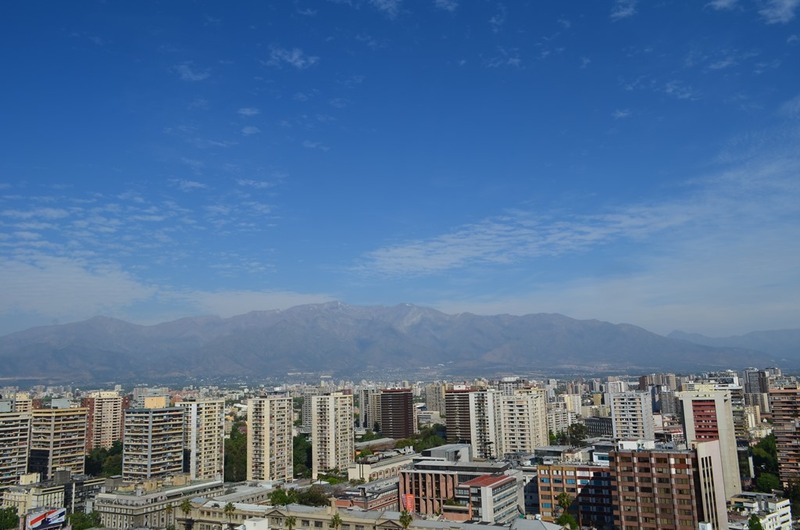 Like many other cities, Santiago has a tourist bus service called Turistik that runs a circular route around the city. You get on the bus, get off wherever you want, and linger at each stop, or not, as you see fit. We decided to use the bus to get around, so we paid CLP$20.000 (see what I did there? about US$40) for an all-day pass, then caught the bus right in front of the hotel. It first stopped at Parque Arauco, a very large and verrrrry upscale outdoor mall where I had dinner and my movie last night. If you’ve been to Redmond Town Center, Levis Commons, or Fallen Timbers, you’ll get the idea (except that Parque Arauco has a car dealership too, so take that, yanquis!) 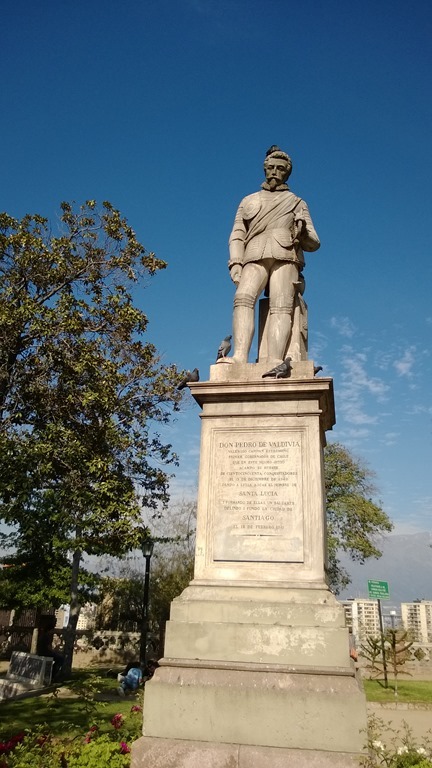 We stayed on the bus and went to Cerro de San Cristobal, where we’d planned to hike the trail to the top. Unfortunately, as we found out after a long walk to the trailhead, the trail on the side of the hill where we were was closed, so we ended up taking the funicular to the top instead rather than hiking around the hill to the other trailhead. The weather was still fairly overcast, but there was a very refreshing breeze on the top of the hill, and the haze wasn’t as bad as it was last weekend when I was there. 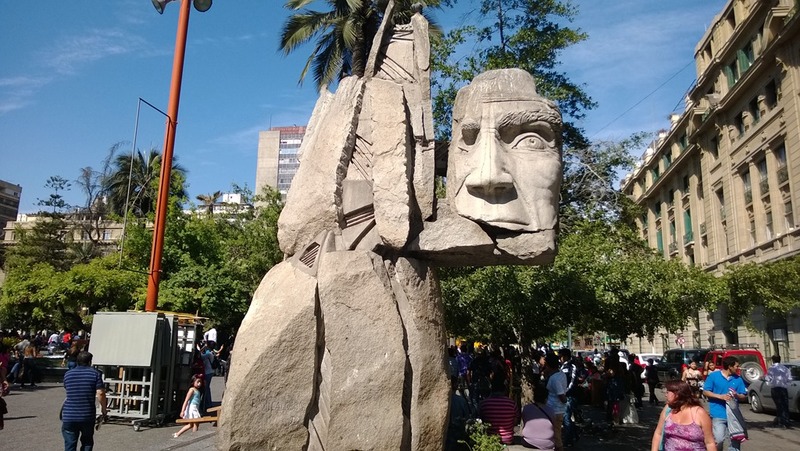 After a short walk around Bellavista, we caught the bus again to Mercado Central(the Central Market), an indoor market that combines several large restaurants (we had lunch at Donde Augusto, which was excellent), a fish market, fruit and vegetable stands, etc. It’s completely touristy but was still pretty interesting. 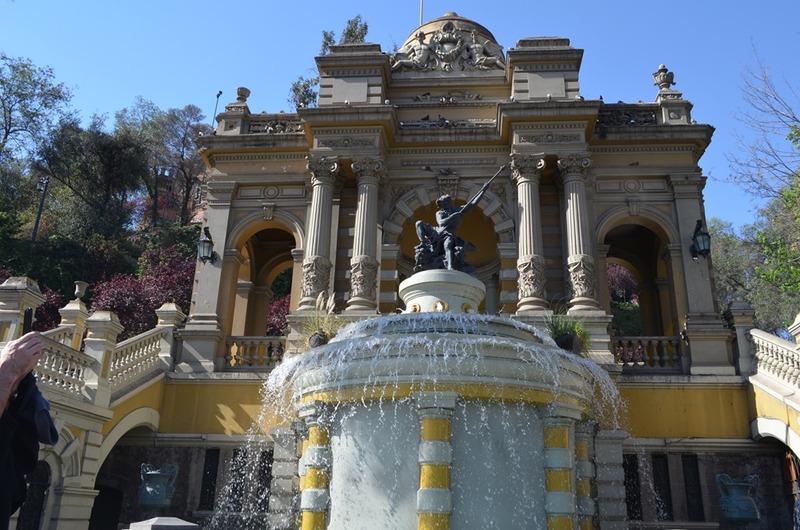 From there we walked to Plaza de Armas, which contains the central cathedral of Santiago, the main post office, and several other major buildings. They were setting up for a concert of some kind, so the square was crowded and busy. 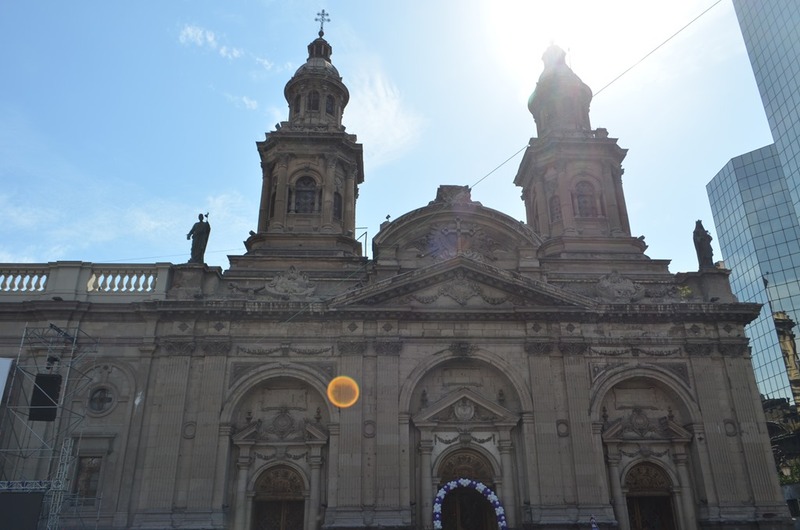 The whole hill is layered with stone staircases and various structures, including several small gardens, a church built in 1872 by Benjamin Vicuna McKenna, and two forts originally built for defense of the city. The views from the top of the hill are spectacular, too. As we were exploring, we could hear what sounded like a marching band off in the middle distance– a little unusual, given that they were playing an assortment of songs including movie themes. They didn’t seem to actually be marching, though. 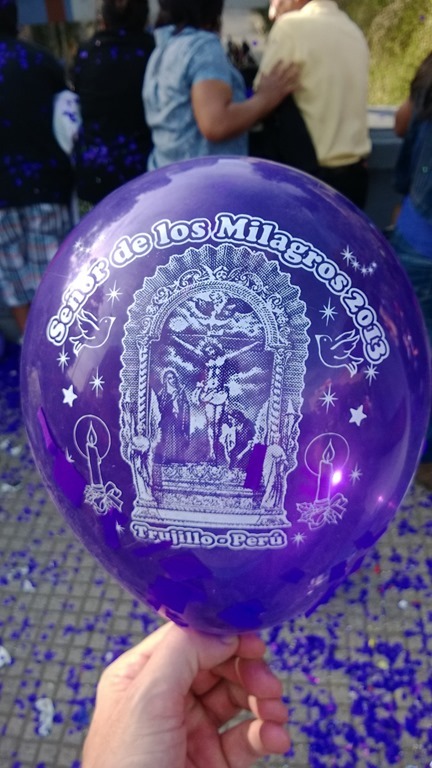 We made our way back down toward the street and I noticed something unusual: there was a medium-sized crowd of people thronging the street, and at a nearby underpass there were big arches of purple and white balloons. We watched for a few minutes and watched as a group of dancers in what I presume was traditional Incan dress (given that their jackets said “Atahualpas de Paramonga”, preceded by a group of drummers, danced their way up the street. 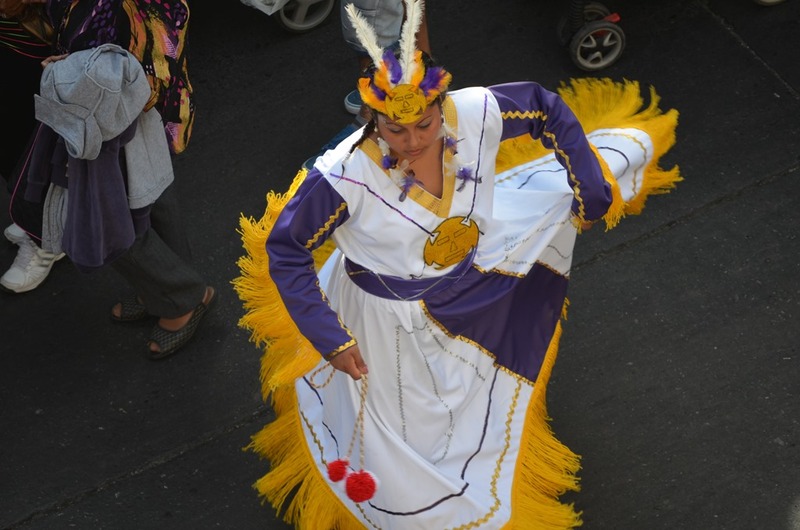 As the dancers moved down the street a larger group came into view, carrying a large, flower-bedecked bier and preceded by a group of women in what looked like purple habits. The women were walking backwards and swinging censers, producing a cloud of smoke such as I haven’t seen since the last concert I went to at Shoreline. 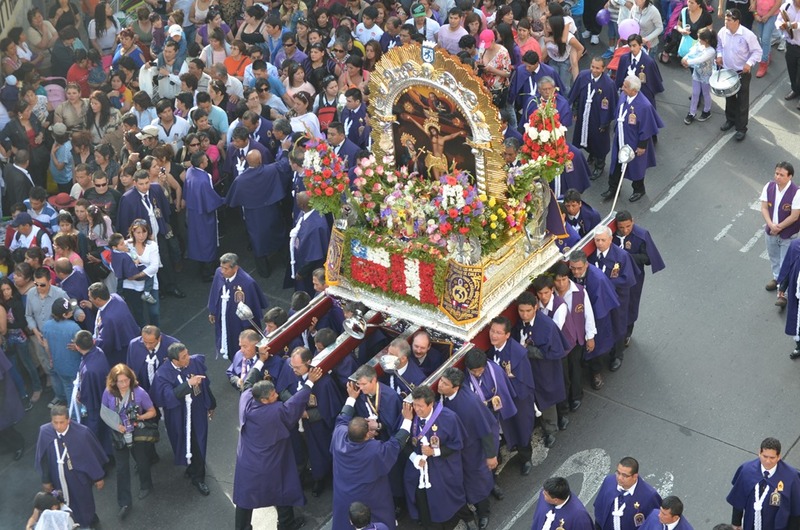 As they passed, I was able to read the sign on the nearest corner of the bier and learned that the bier was carried by members of Hermandad del Señor de Los Milagros, or the Brotherhood of the Lord of Miracles. We had lucked into part of the annual procession honoring the Lord of Miracles, which takes place on the last Sunday in October. 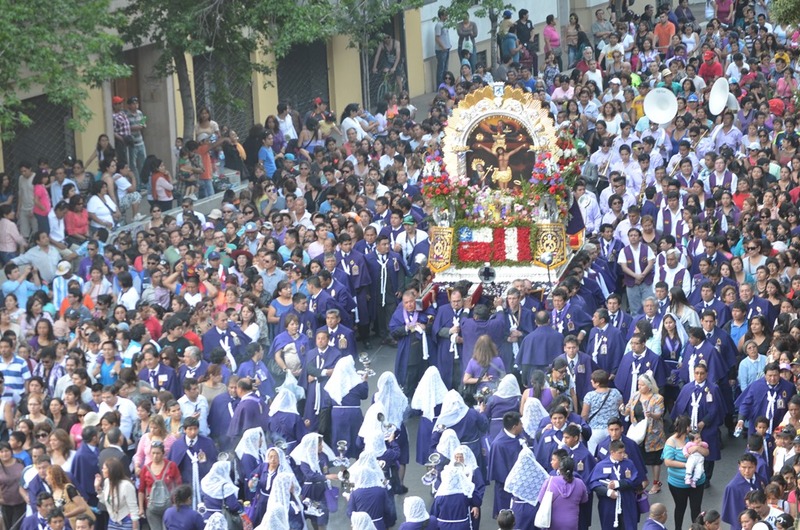 The tradition started in Peru but has spread worldwide. 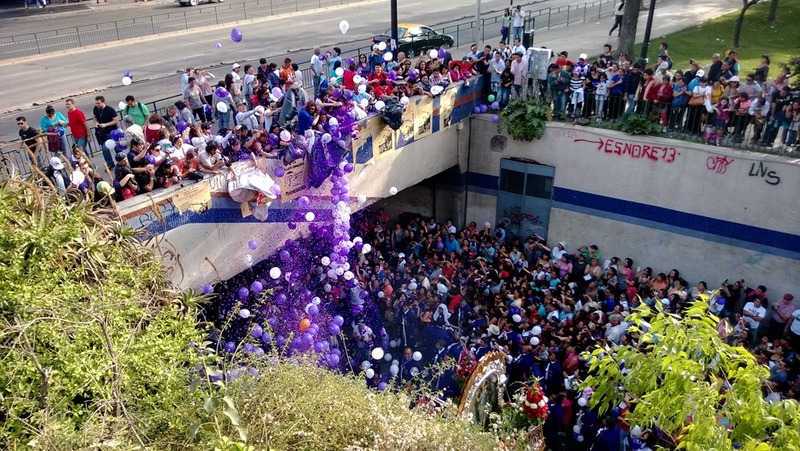 As the procession neared the underpass, the waiting spectators dumped glitter and balloons on the celebrants below, who gleefully stomped on the balloons to pop them. After the procession left, we walked back to the bus stop, but the bus was long gone. We walked for about a mile and a half until we found a cab, then headed back to the hotel, where I passed a quiet night working on slides for the webcast I did yesterday. All in all, it was a day very well spent, and it was fun for a change to go prowling around the city with someone instead of kicking it solo. Thanks, Dave!